From elegant to whimsical, Christmas stockings are a great way to add a pop of holiday cheer to any room. Plus, they can readily be sewn in a few hours of enjoyable sewing time. Enjoy this sewing tutorial! This free pattern from Pellon Projects was designed by Rachel Gander. Today we’re going to change it up to feature a traditional Tumbler pattern as the front of the stocking. We’ve chosen rich, gorgeous silks to complete the look. Assorted brown, red, and green silk dupioni, poly dupioni, or fabrics from your stash. Cut a total of 30 tumbler patches. For each solid fabric tumbler, the cutting directions are the same. Cut 4-1/2″ wide crosswise fabric strips. Align the template as close to the cut end as possible. Flip the template, align the traced edge with the template side, and trace the other side of the Tumbler shape. Repeat the process until the entire fabric strip has been marked. Use a rotary cutter and ruler to cut on each marked line. Repeat marking and cutting steps for each color. Arrange the six tumblers into five rows. Notice the ends are staggered. We’ll be cutting our stocking shape from this modified tumbler block; having squared ends isn’t necessary. Offset the end ¼″—the seam allowance width. Stitch. 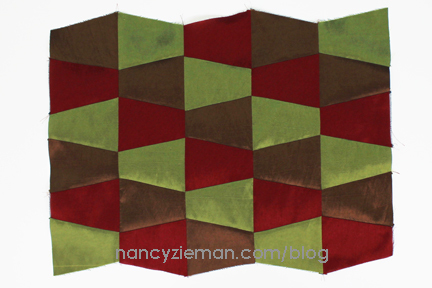 Join the block pairs with a 1/4″ seam allowance. Join pairs to form rows. Join rows using a 1/4″ seam allowance. To prevent the edges of the seams from making an imprint on the right side, press the seams over a sleeve roll. If you don’t have a sleeve roll, tightly roll and tape several magazines or catalogs. Cover with a wool fabric or wool felt and hand stitch. The fabric will absorb the moisture of the iron. Use temporary adhesive basting spray to attach the patchwork tumbler to the interfacing. Use a machine straight stitch to stitch in-the-ditch though the patchwork and the interfacing. Download and print the stocking pattern from Pellon Projects. Align the stocking right and left sides. Join with clear tape. Note from Nancy: For our stocking, we are using the stocking shape provided and we’re skipping the stitched design. Align the top and bottom halves. Join with clear tape. Cut out the paper stocking pattern. Position the paper pattern on the interfacing side of the patchwork tumbler. Pin. Use a rotary cutter to cut around the paper pattern. Lay the paper pattern on another piece of interfacing. We’ll use this for the back of the stocking. Rotary cut the second piece of interfacing. Cut one stocking from the green silk stocking back fabric and two stockings from the green lining. Spray baste the interfacing to the stocking back fabric. Fold the rectangle in half lengthwise. Finger press the folded edge. Open the rectangle. Meet long edges at the fold. Fold in both top and bottom edges. Press. Fold in half lengthwise again. Press. Fold the loop in half and pin the cut edges to the top of the stocking lining. Layer the lining onto the stocking fabrics, for both back and front pieces. Pin along the top edge. Use a 1/4″ seam allowance to stitch along the top edge of each the back and front fabrics. With both stocking back and front open and flat, match right sides and pin. 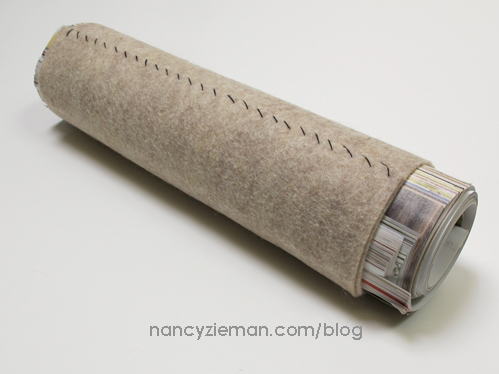 Note from Nancy: When joining the stocking, we need to leave an unstitched opening along the lining straight edge. To remind myself to stop stitching at this area, I place a pin parallel to the cut edge, rather than perpendicular. Stitch around the stocking using a 1/4″ seam allowance. Backstitch at the start and finish, leaving 4″ unsewn along the lining’s straight edge. Press the seam allowance at the opening. Use a rotary cutting pinking blade to trim excess fabric from the seam allowance at the curved edges. Turn the stocking right side out through the opening. Tuck the lining into the stocking fabric. Nancy Zieman—author, pattern designer, businesswoman, producer, and national sewing authority—is the host of the popular show Sewing With Nancy®, which appears exclusively on public television stations across the United States and Canada. Follow Nancy’s blog at NancyZieman.com/blog and sign up to receive Nancy’s E-News for the latest news in Sewing, Quilting, Creating, and Block of the Month updates. This would be great to win this. I probably wouldn’t have time to make any for Christmas, but one of my friends whom wears these has a birthday coming up in March. Would make the perfect gift! My fitting problems involves the fact that one shoulder is higher than the other one. Charmaine, our social media coordinator will help you out. She’ll email you if there are issues. Sorry that you had problems. Thanks for all your tips on sewing. I have recently retired and I finally have the time to make all the things that I’ve had to put off because I didn’t have time to sew. I have gotten really good at following a pattern, but I’m not the same size as the printed patterns. The last time I tried to alter a pattern I really messed up. I’m going to watch your programs again about how to alter a pattern. Maybe one day I will succeed at that too. Thanks for inspiring me to try again. Trying to use up tubs of fabric before I die. Maybe this will help me do this. Sewing gifts sure makes you feel better. Where is the form for the stocking? I can’t find the link. Can I enter a knitted 23-inch Christmas Stocking, or must it be a ‘sewn’ Christmas Stocking? It must be a sewn stocking. Thanks for following along! Love your ideas. I will be making Christmas aprons and fleece pillows w/sorority logos for grand nieces. Last year’s stocking entries were so beautiful. It will be exciting to see this years stockings. Thanks to the prize sponsors for such wonderful prizes! I think I downloaded my pictures correctly, but where can I see the pictures that are in the contest? Veronica, did you refresh your page? If so and you still can’t see your image, please contact [email protected] and we’ll guide you through the process. I already had a goal for making new stockings for everyone this Christmas. Last year I bought some beautiful red velvet on sale just before Christmas but I was already out of time. Now I have an added goal to refine the plan and get them under way now. I love the prizes! I don’t know which one I’d rather have! I just hope I can come up with something up to the task of winning! What a fabulous challenge! I have never sewn a stocking before and I do need to make one for our bunny…everyone needs a stocking right?!?! I am hoping to join in this challenge! Love your sample. Very pretty and classy! OK, I’m in. I think I’ll make two. One for each of my pups. I made a stocking many years ago when my son was little and we were visiting Grandma and Grandpa for Christmas. I had forgotten to pack his stocking so I made one. It had a removable toy on the front as well as other Christmas decorations. My son still has that stocking and hangs it for his kids now. I am Grandma Zoo now.